The micro:bit Educator's Lab Pack includes 10 micro:bit boards and everything you need to get you started with the new learning platform. The Lab Pack has everything you need, including micro:bits, cables, battery packs and a few parts to experiment with. 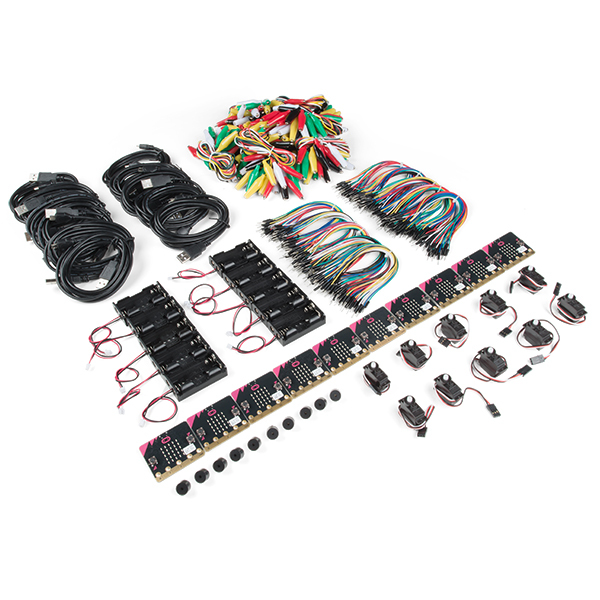 This package provides an easy way to introduce your students to the micro:bit without any difficulty or parts hunting. SparkFun packages everything educators need to get started with the micro:bit in a variety of classroom settings and learning environments. The hardware boards, cables and extra parts come pre-packaged. Examples and curriculum materials are available from SparkFun and micro:bit, as well as from other educators involved in this growing maker education movement. Lab Packs are your classroom entry point. By combining our kits, popular boards and other educational tools with support materials, SparkFun brings all the power of the open source community to the classroom. The 10 pack seems to be the right number of Micro:Bits, but a few areas of suggested improvements: 1. The alligator clips were hard for the 5 & 6 graders to work with. The were slippery and not easy to clip to the boards and the teeth didn't grab the pins of the speaker or the patch cables so connection issues cropped up in class. 2. The battery packs should have a on/off switch. Once they are connected to the board, it is hard to unplug them so I had the students remove one battery instead of fighting to unplug the board. 3. The USB cable was too long. I know the "Go" kit has a very short cable which can be a problem, but a 24" cable would be perfect IMO. 4. It would be great if the pack included 10 of the cool red Spark Fun boxes (in a flat un-assembled format for shipping) so each student could store his stuff in a project box. I ended up going to a local craft store and buying boxes for each student. When my month long class ended, the student was able to take the project box and contents home with them to keep and continue to learn! This is a great little board and the students loved the 8 session class. I purchased another one of these kits for my next class.